“As this article from the London Times shows, the Irish government is holding the line very well against any British attempt to re-establish a ‘hard’ Border. 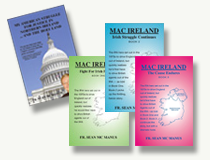 I was born and reared by the British-imposed Border that cruelly partitions Ireland. London passed the Government of Ireland Act in 1920, dividing Ireland into two artificial units: Six Counties in the north east, and 26 Counties for the rest of the country, ‘Southern Ireland’ (even though County Donegal is the most northern County in the whole country). Indeed, that damn Border partitioned not only my country but also my historic parish of Kinawley—leaving part in Fermanagh, one of the Six Counties in Northern Ireland, and the other part in County Cavan, one of the 26 Counties of the Irish Free State, which was named Republic of Ireland in 1949. The Taoiseach has challenged new claims made by the British Brexit secretary that the border issue can be solved through technology. David Davis told a Brexit committee in Westminster yesterday that the technology to deliver a near-frictionless border — including number-plate recognition, authorized economic operator systems, and electronic pre-authorisation — already existed and said the UK government had started talks with potential suppliers. Mr. Coveney said on a trip to Derry yesterday: “This is not going to be solved by technology and cameras and scanning systems and drones on the border. “What’s required here is a backstop, which is a political agreement that is consistent with maintaining full alignment with the rules of the customs union and single market in the areas that are necessary to allow for the all-island economy to function, and north-south co-operation to function, and to protect the Good Friday agreement. Mr. Davis said that the UK planned to submit a new “backstop” for the border. Last year, the Irish government hailed a “bulletproof” backstop plan that would effectively mean Northern Ireland would remain in the customs union if no other agreement were reached. The UK has rejected this plan and six weeks of negotiations in Brussels have failed to break the deadlock. Mr. Coveney said there was “nothing artificial about the commitments that have been made in dealing with the border issue comprehensively.” The Irish government was not asking for everything to be finalized by June, he said, but it did expect to see significant progress.